Yuming Matsutoya (Yumi) has been a star in Japan for forty years, and has done sell-out tours every year, usually with big productions. For her fortieth anniversary tour she had the dream to go back to the band that not only influenced her musical taste, but also were the reason she actually started singing: Procol. 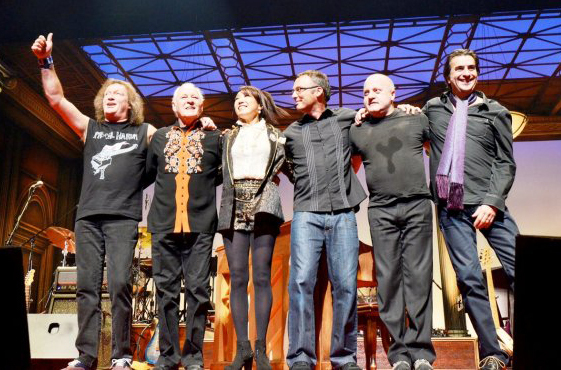 The tour and the merchandise is labelled "Yumi Matsutoya and Procol Harum – back to the beginning". Her massive fan base is fully aware of the position Procol has always had in her career. Every show we do now, the audience are treated to sixty minutes of Procol music, as they wait for the show. There is also a temporary club in Tokyo from 16 November for six weeks, called 'Procol Harum', which is playing only PH songs, plus covers of AWSoP. The show in Tokyo will recorded for later broadcast, so hopefully you will be able to judge for yourselves if you can find it. It will be transmitted by WOWOW, which is a cable company. I will agree that it is an usual collaboration and some of [Beanstalk readers] will question it. It's hard work, but it is also fun and I believe everyone is enjoying it. Last night's performance was filmed by WOWOW with 26 cameras; tonight, back-up night with only 15 cameras. The band visited the Procol Harum bar last night, and Yumi also came along later. Re the WOWOW site, it looks as if you have to register (by clicking on the pink box for "New Online Registration and/or the blue box "OWOW Member Registration") if you want to access the 'on demand' feature. Registration is free, but it may be difficult navigating/completing registration without being able to understand what you have to input/where. It looks as if you have to be registered even to watch the programme at transmission time (9.00, March 31).